Kuari Pass Trek (3710 meters) is one of the most popular and beautiful treks of Himalayas. The most noted and highest of the Indian Himalayan Peaks visible from this trail includes Kamet (7750 meters), Trishul (7120 meters), Chaukhamba (7130 meters), Nanda Devi (7815 meters), Nanda Devi East (7430 meters). Among the others are Nanda Ghunti, Hathi Ghoda Parbat, Dronagiri (7065 meters), Changabang (6870 meters), Neelkanth, Mana (7230 meters), Rishi, Mukut and many others. The peaks dance to tunes of the trek and it seems like Kuari Pass Trail has offered its invitations to most of the popular peaks of Himalayas on a grand party. The best time to conduct this trek is in Winters when the impressive skyline and these mighty mountains are in their full glory. The trek begins from Joshimath and proceeds through small villages thus enabling the trekker to also observe the remote village life of the Himalayas from up close. There are beautiful forests, flowers, enchanting wild life trails, snow capped peaks, gurgling rivers, and abundance of rhododendrons in full bloom. The walk over lush green meadows and vast pastures and a visit at Ski Village of Auli makes it all the more fun. It's an easy trail and offers the most spectacular views of the Himalayas which are a feast to the trekker's eyes. 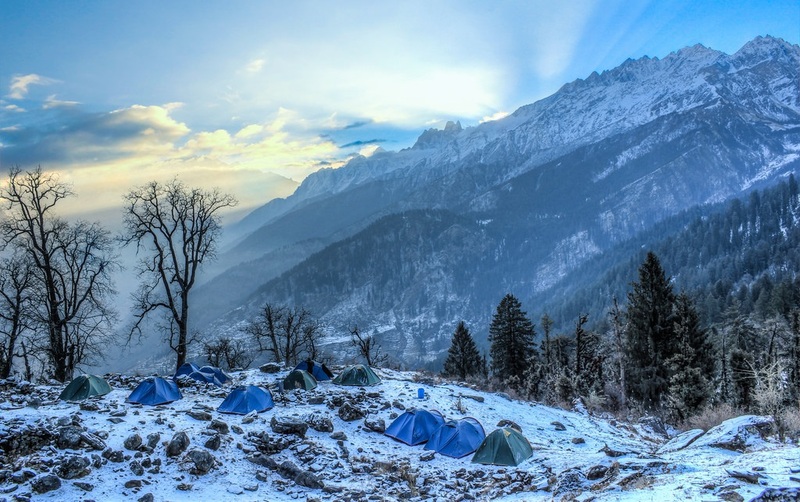 The trek being close to Nanda Devi Biosphere Reserve which is prescribed by Unesco, Kuari is situated in the most remarkable regions of Garhwal and offer beautiful camping grounds at Gulling and Tali with ever changing landscapes. The trail is replete with tribuatories of river Ganges andt the mountain ranges extend to it's west to the ranges of Gangotri. The views of the winter Kuari Pass Trek are the best in the Indian Himlayas. The entire trek in Winters is covered with heaps of snow and the possibility of snowfall always there.